The theme of the JALT 2009 conference was The teaching-learning dialogue: An active mirror. In the area of self-access language learning the teaching-learning dialogue primarily takes place in the language advising situation. In this forum, educators from different universities in Japan addressed the following questions: What form does the teaching-learning dialogue take in your centre? How has this dialogue informed the practice of learners and educators working in your centre? For a fuller discussion of the role of dialogue in self-access learning (based on presentations at this forum), see Mynard & Navarro (2010). Jo Mynard and Diego Navarro (Kanda University of International Studies) described the types of interactions which occur in the language advising services offered at the Self-Access Learning Centre (SALC) at their institution. They described how the approach to advising draws on sociocultural theory and constructivism, emphasizing the promotion of critical reflection through social interaction and on creating opportunities for learners to reconstruct meaning. Interaction takes the form of face-to-face meetings and is also facilitated through a written dialogue via weekly journals between learning advisors and students. Greg Lindeman (Soka University) described the “English Forum” at his institution which is a programme that provides students with opportunities to discuss a variety of topics with other students. The interaction is unique as the entire process is managed by the students themselves rather than teachers or administrators. The self-access centre employs around thirty students who facilitate one hour discussions with groups of between six and ten people. The discussions run three times a day with as many as six discussions occurring simultaneously. Daniel Sasaki and Yukiko Ishikawa (Soka University) discussed three different approaches to the advising service offered at their institution. Initially advising took the form of strategy advice. This was later replaced with a system where the learning advisor set tasks that required follow-up on the part of the learner. Currently, the learning advisors are trialling a dialogue approach which stresses the importance of negotiation and discussion. The learners are encouraged to take more responsibility for their own learning and set short-term goals for themselves. Stacey Vye (Saitama University) described a peer mentoring system operating at her institution. Learners have opportunities for casual exchanges, and also to attend workshops and advising sessions. These kinds of interactions give learners access to multiple perspectives in addition to practicing the target language. Students are involved in running the self-access centre and a scenario exists where learners are teaching and teachers are also learning. Herman Bartelen and Hisako Sugawara (Kanda Institute of Foreign Languages) discussed developments over the past few years in the advising services at their two year vocational collage in Tokyo. The demand for advising services has been steadily increasing and the success has been attributed to a number of factors: the opening of a new self-access centre, the hiring of a trained, experienced learning advisor, an increase in the number of orientation sessions for students, and additional advertising. The advising sessions are all face to face and take place in the learner’s choice of language (English or Japanese). 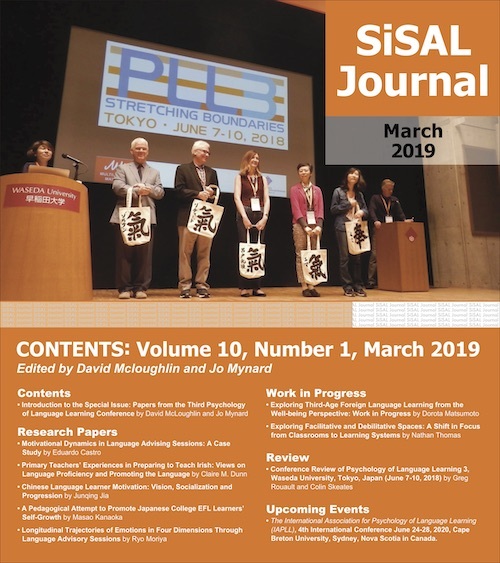 JASAL aims to promote self-access learning in Japan and to support educators in their efforts to provide self-access language learning opportunities at universities and high schools. To learn more about JASAL, or to become a member, visit the JASAL website (http://jasalorg.wordpress.com). Jo Mynard is the director of the Self-Access Learning Centre and assistant director of the English Language Institute at Kanda University of International Studies in Japan. She has been involved in facilitating self-access learning since 1996. Diego Navarro has been teaching English for over ten years in a variety of settings. In his current position as a learning advisor at Kanda University of International Studies, he is involved in promoting learner autonomy and effective learning strategies. Mynard, J., & Navarro, D. (2010). Dialogue in self-access learning. In A. M. Stoke (Ed. ), JALT 2009 Conference Proceedings. Tokyo: JALT.